An acoustic "tractor beam" that can pull an object by firing sound waves at it has been created by physicists in the UK and US. The beam was made using a commercial ultrasound surgery system and differs from previous tractor beams that use light. The researchers say their technique could be readily adapted for medical applications that manipulate objects or tissue within the body. The new tractor beam has been created by Mike MacDonald and colleagues at the University of Dundee, University of Southampton and Illinois Wesleyan University by using an ultrasound ablation system, which is normally used to destroy tumours thanks to focused beams of intense sound. First proposed in 2006 by Philip Marston of Washington State University and realized using light in 2010 by David Grier and colleagues at New York University, the technique involves firing two beams of ultrasonic waves upwards at a triangular-shaped target at about 51° either side from the vertical direction. 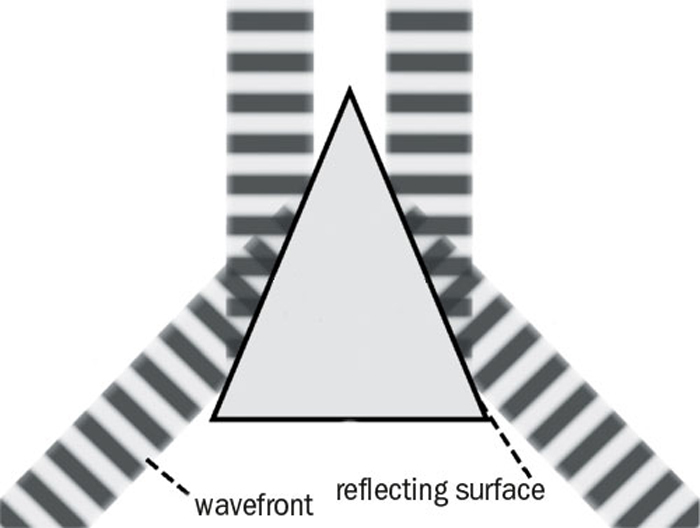 The target is shaped such that the beams bounce off opposite sides of the triangle, causing the reflected sound to travel straight up (see figure "Reflecting beams"). Ideally, the technique requires the use of two "Bessel beams", which have circular wave fronts that curve around the direction of propagation and so carry angular momentum. When the wave front strikes the target, the angular momentum is redirected as regular momentum and if the target and beams are arranged correctly, more of this "skew" momentum will be reflected up than down. This results in an equal-and-opposite downward force on the triangle, which is pulled towards the plane containing both ultrasound sources. Although the researchers were unable to create an ideal Bessel beam, they approximated it using a commercial array of ultrasound sources originally designed for focussed ultrasound surgery. They set up their tractor beam in a tank of water using ultrasound at 550 kHz, with the triangular target suspended on a balance and ultrasonic sources arranged so that the tractor beam pulls it down. Vertical forces due to the ultrasound are then measured by monitoring the weight of the triangle, with the triangle experiencing an extra downward tug of as much as 1 mN when the ultrasound was switched on. As for practical applications of the tractor beam, MacDonald says that its operation is not limited to pulling triangular-shaped objects – which were used to make the concept easier to understand – and it would work on objects with a range of different shapes. Indeed, in 2010 Grier and colleagues used a similar optical tractor beam to pull spherical particles. According to MacDonald, the technique could have a range of applications in medicine, including manipulating objects, fluids and tissue inside the body. A tractor beam could, for example, be used to deliver encapsulated drugs to the exact location of the body that requires treatment. And because the technique makes use of equipment that is already approved for medical use, MacDonald believes that new treatments based on ultrasound trapping could be developed quickly. Looking beyond medicine, Grier points out that acoustic tractor beams can move much larger objects than their optical counterparts, and so could prove useful for remote sampling. "This would include gathering samples of dust and other small particles from dangerous and hard-to-reach places for environmental monitoring, geophysics (volcanic plumes), atmospheric testing, and oceanic testing, to name just a few," he says. The tractor beam is described in Physical Review Letters.